One of James Russell’s lecturers at the University of Queensland was the late Max Horner. 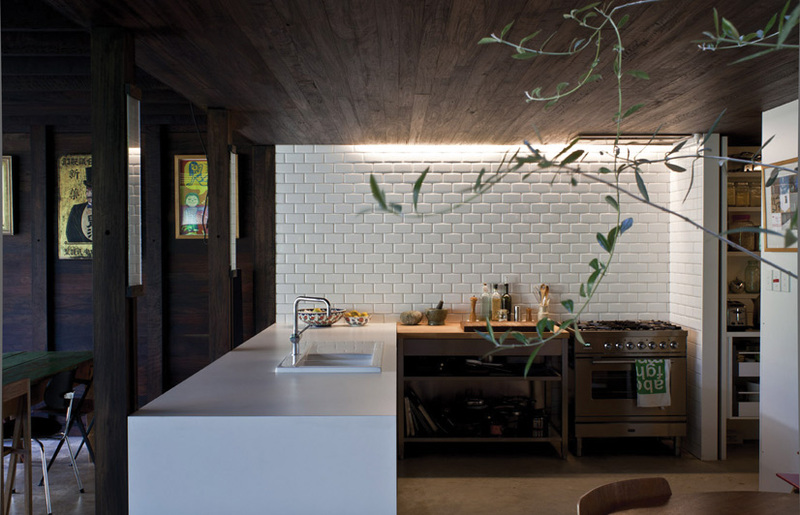 Horner dramatically deconstructed his inner-city timber worker’s cottage, cutting away floors and walls to release three storeys of internal voids, while relying on the building’s bounce and sway during parties to gauge the limits of structural adequacy. 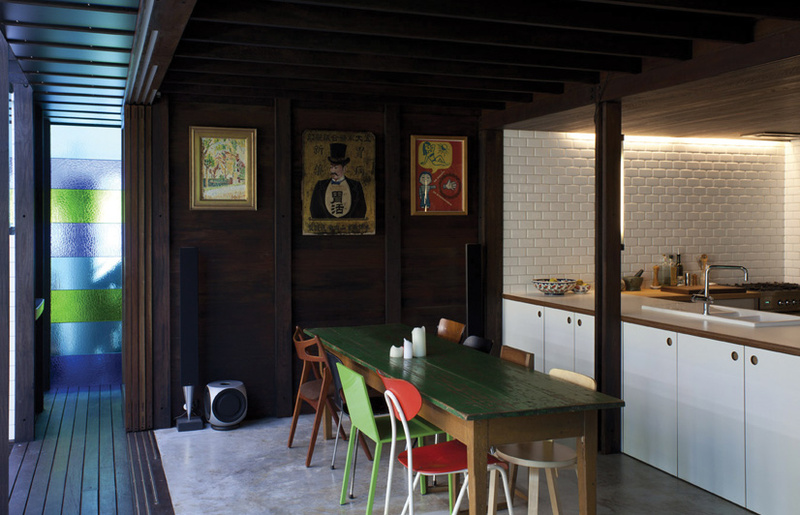 There is a sense of Horner’s bravery in Russell’s extension to a four-room worker’s cottage in Brisbane. The eastern hall wall and room partitions have been stripped out to create an open gallery room that has a generosity uncommon to a house of this era. 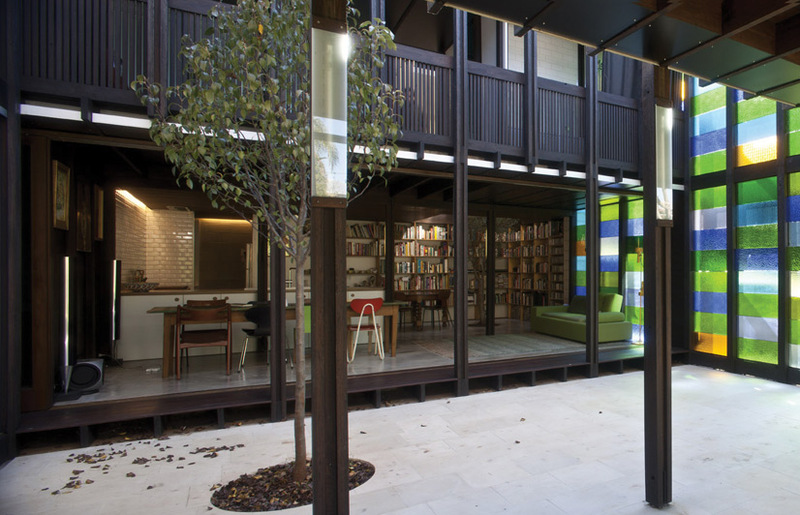 A central void framed by recycled timber boarding peers down to the magic of an olive tree growing up through the centre of a book-lined library room. Indoor trees are not usual, even in the most ramshackle Queenslander, but this one is completely at home. In this corner of the old house, the tongue and groove hoop pine ceiling has been removed and the roof sheeting replaced with roof glazing. The pyramidal attic void is unsealed, revealing its structural innards, though hips, rafters, battens and iron are painted matte black to recede into a mysterious murky darkness. Two parallel double-height east-west wings have been added behind the house as the ground level drops from the road, one replacing the old lean-to rooms and the second forming the southern boundary beyond a central courtyard, at the centre of which is an ornamental pear tree. The volume attached to the old house has bedroom and bathroom upstairs, and family kitchen/dining/library downstairs. The parallel wing to the south has the principal bedroom, an open shower zone upstairs and an open undercroft below that extends the paving of the courtyard. On the third, western side is a narrow circulation and service spine creating a ‘U’, which is comprised of toilets, laundry storage and garden shed. 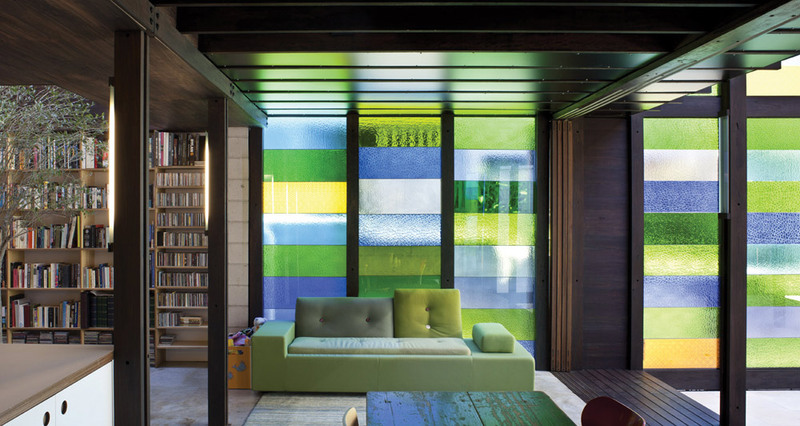 Privacy is maintained on the fourth side of the court by a full-height, multi-coloured glass screen wall that catches eastern light. Russell is developing a reputation for daring dwellings that challenge the conventional idea of what constitutes a ‘house’, and it’s not strictly correct to describe these spaces as rooms. At the lower level, the family spaces are only occasionally enclosed by banks of sliding glazed timber doors, a second line of doors at the far extremity of the undercroft provides an alternative wind break and security line. 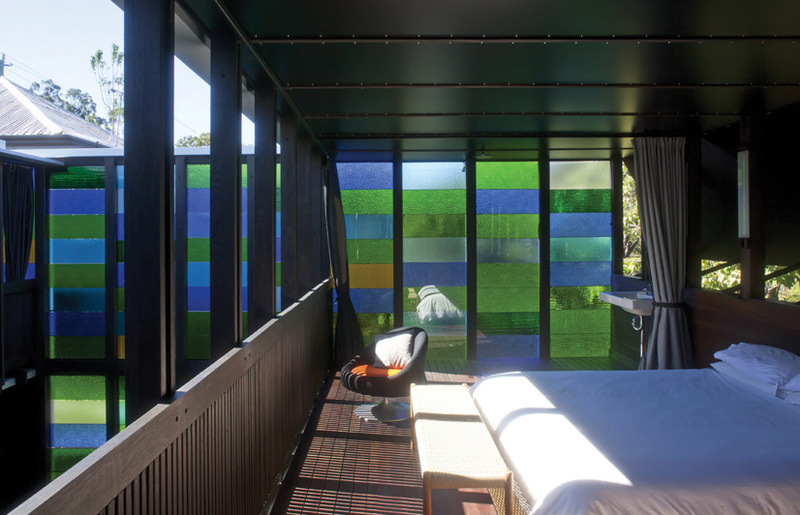 Upstairs, the southern wall of the main bedroom is reasonably conventional, with a series of strutted push-out panels creating a line of windows. However, the spaces looking into the courtyard have balustrades but no walls. Water-proof curtains can be drawn across and secured in really bad weather and as a safeguard the flooring within 600 millimetres of the edge is detailed as a self-draining deck. A direct engagement with nature and climate, more commonly associated with camping or sailing, is here inserted into everyday life in the inner suburb. The dwelling vessel requires active tuning to ride out the worst storms, but in exchange it offers a rare opportunity to sensually luxuriate in the best of the subtropical weather. This commitment to raw (or at least, rare) living is part of a noble tradition of minimal timber structures offering minimal enclosure. 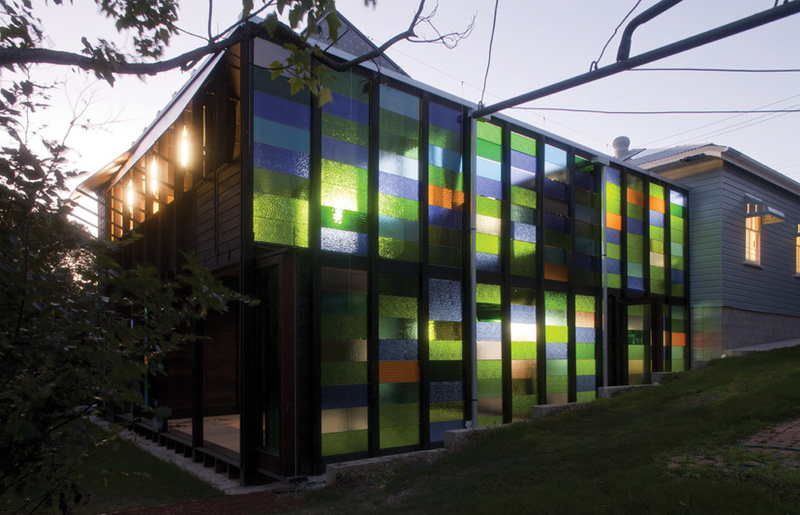 There is a fellowship of exceptional Australian architects who have devoted years on site to extend their architectural knowledge with the skills of the artisan builder, carpenter and joiner and who seek a minimal architecture from which to directly experience the landscape and the movement of time. Russell has learned from and been inspired by Richard Leplastrier, Peter Stutchbury, Peter O’Gorman, Drew Heath and his on-site partners Andrew Schindler and Peter Harding. 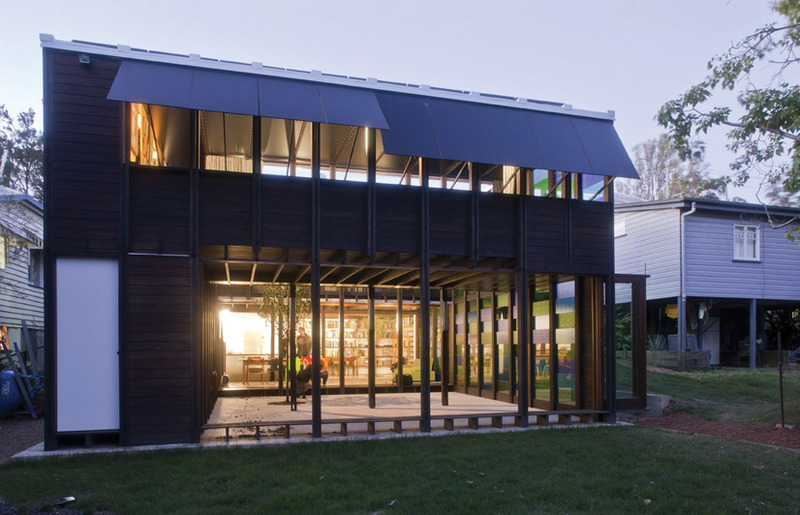 With the Raven Street House he can lay claim to inclusion within this band of disciplined masters of timber construction. Conventional use of timber in housing demonstrates little confidence in its structural capacity, relying on multiple redundancies and factors of safety to cover for natural variability, and low strength exotic (and intrusive) softwood species are often favoured. These timber masters, on the other hand, revel in the strength-to-weight and natural durability of carefully selected native hardwoods. They acknowledge the possibility of twisting during curing or splitting in tension and devise composite member assemblies and careful joints to maintain structural integrity. They understand the processes of weathering and the need to care for end-grain. They recognise the true ecological value of these sticks of sequestered carbon and design for disassembly and reuse. The Raven Street House is spatially varied, but in construction is designed on a rigorous constructional module of rafter, stud and joist portals. This frame is built of ‘H’ section composite posts, fixed to neutralise potential twisting, which form a channel for inset walling boards and ceiling panels. The rigour of the design is unyielding. The framing system, combined with horizontal chords at the top and bottom of balustrades, accommodates indirect load paths and allows discrete integration of cabling, lighting and cabinetry. The richness of this house, which has grown from the multiplication of a single joint, has a marvellous fractal scaling that seems to confirm Mies van der Rohe’s suspicion that there is, indeed, a deity dwelling in the detail. Peter Skinner is associate professor of architecture at The University of Queensland and Queensland president of the Australian Institute of Architects.